The story of the Messerschmitt Me 210 reads like a Shakespearean tragedy. Our flawed main character contributed to the downfall of many great reputations, the suicide of the famous Generaloberst Ersnt Udet, and the wasted lives of many German airmen. It was the subject of ongoing bureaucratic interference and clashes between high profile political, military and political personalities. Perhaps most importantly, this flying cul-de-sac diverted limited production resources away from proven defensive aircraft in the critical mid and late-war years. The Messerschmitt Me 210 was conceived as a development of the Bf 110 even while the earlier type was in the prototype and early production phase. In these years leading up to the Second World War, the heavy fighter, or Zerstorer, was considered to be the prestige arm of the Luftwaffe. The concept would not falter until the Messerschmitt Bf 110 was tested and bested in the skies over Britian during the fateful summer of 1940. The Me 210 was not, as legend sometimes has it, designed as a replacement of the Bf 110 due to any known failures or shortcomings of the first Messerschmitt heavy fighter. Rather, it was considered to be a more versatile and technically sophisticated design capable of fulfilling even more roles than the Bf 110. Such was the confidence in this new multi-role design that mass production was ordered even before full flight testing of the prototypes was completed. The original flawed short rear fuselage was largely responsible for potentially fatal flight characteristics, especially during takeoffs and landings. Eventually, the fuselage was lengthened and this improved the handling of the aircraft. The Me 210 was not declared suitable for operations until well into 1942. Even then, indecision about the proposed roles and a reluctance on the part of operational units to use this new type limited its production and deployment, although those that did see service garnered favourable reports. When the DB603 engine was finally available, the new variant was named the Messerschmitt Me 410. The new designation was partly intended to distance this aircraft from the disasters of the Me 210. The Me 410 proved itself to be a versatile and successful aircraft. However, by the time it was entering service, there were already more capable contenders for the roles of heavy fighter and bomber in the wings. 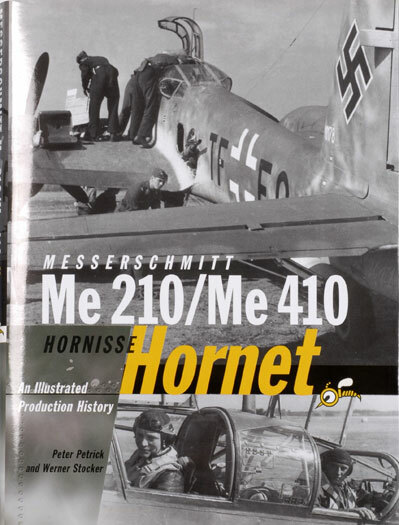 "Messerschmitt Me 210/Me 410 Hornisse Hornet" is presented in a hard cover behind the familiar Classic Publications dust jacket. This newest book comprises 144 pages of premium quality paper. This new book examines the development and dilemmas, technical and bureaucratic, of the Messerschmitt Me 210/410 as well as providing a detailed production history, photo gallery, illustrated guide to design evolution and development proposals for the Me 410. More than 250 photos, technical drawings and tables are an essential part of the book. The colour artworks by Tom Tullis are superb as always. The book is presented very much in five separate parts. The first 50 pages supplies text in small font covering the development and eventual entry to service of the various types. This text is interesting and very readable. The next Chapter is entitled "Werknummer List", which is actually understating this resource. 24 pages thorughly list the Werknummer, variant, factory/unit codes, units, dates and additional notes for every known Messerschmitt Me 210 and Me 410. The Photo Gallery, Design Evolution and the final Chapter on Messerschmitt AG Proposals for the Me 410 all fill in the picture on this fascinating but flawed family of German aircraft. Classic Publications' Messerschmitt Me 210/Me 410 Hornisse Hornet will be a welcome resource for modellers and Luftwaffe enthusiasts alike.